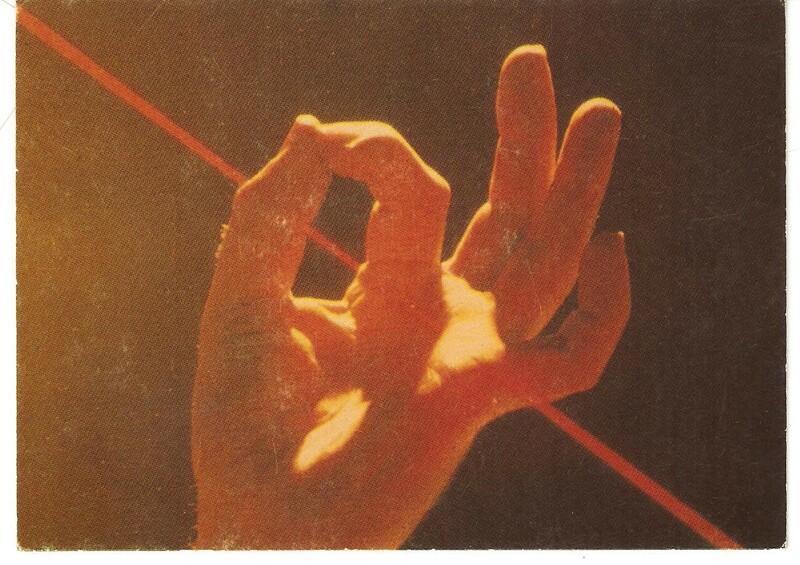 The tiny beam from a laser is “cleaned” and diverged when it passes through a spatialfilter. 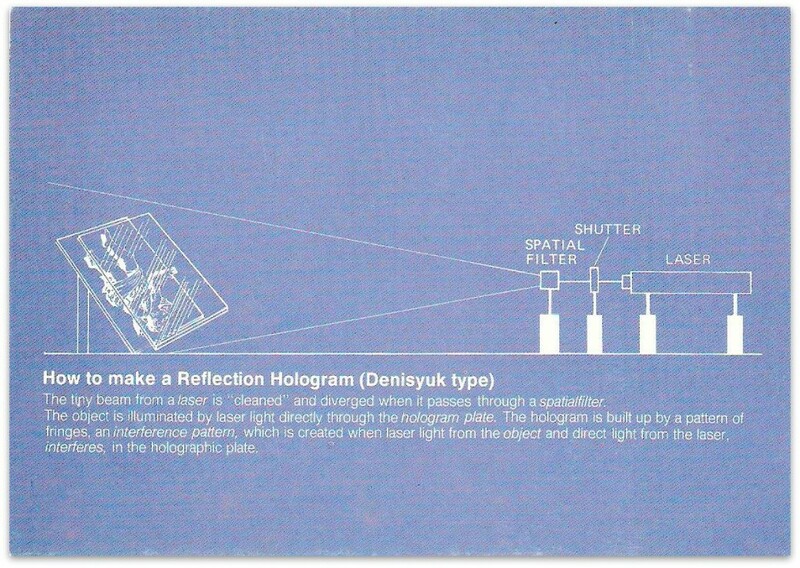 The object is illuminated by laser light, objectlight, and some of this light is reflected against the hologram plate. The plate is also illuminated by light which is directed from the laser with a mirror, referencelight. The hologram is built up by a pattern of fringes, an interference pattern. This pattern is created when the object and the reference light meets, interferes, in the holographic plate. 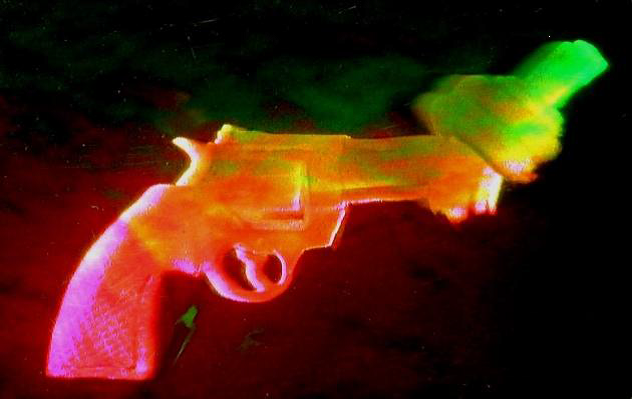 This type of hologram can not be seen in ordinary light from a spotlight only by using laserlight. The tiny beam from a laser is “cleaned” and diverged when passes through a spatialfilter. 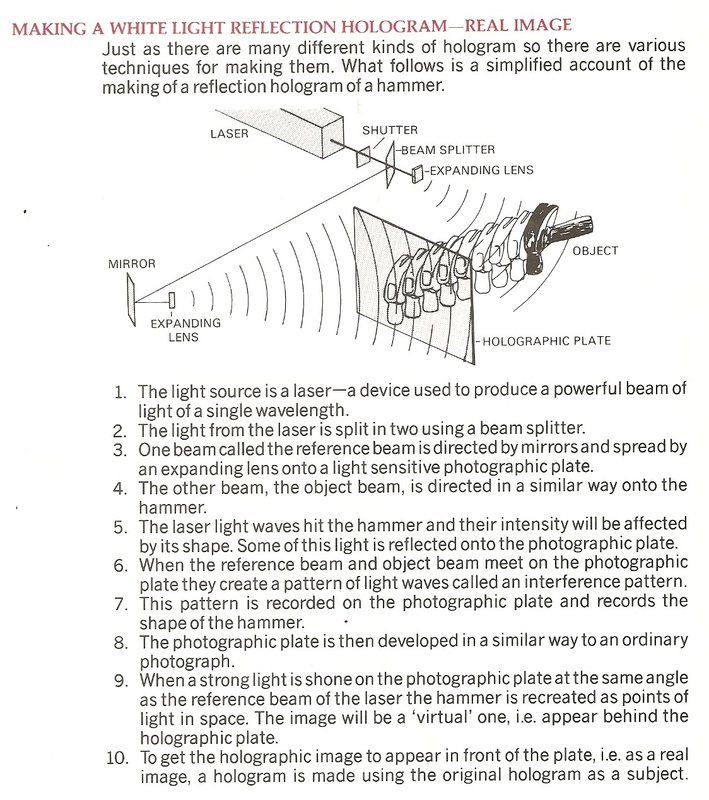 The object is illuminated by laser light directly through the hologram plate. 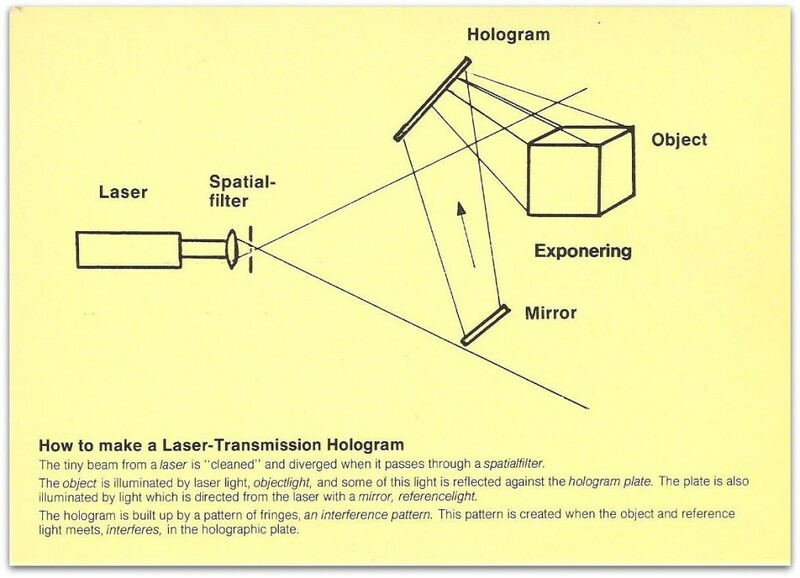 The hologram is built up by a pattern of fringes, an interference pattern, which is created when laser light from the object and direct light from the laser, interferes, in the holographic plate. This hologram can be seen by using ordinary spotlight. The Photography register what the camera’s lens registers (A). How the object looks from any other points outside the camera lens is not registered (B). 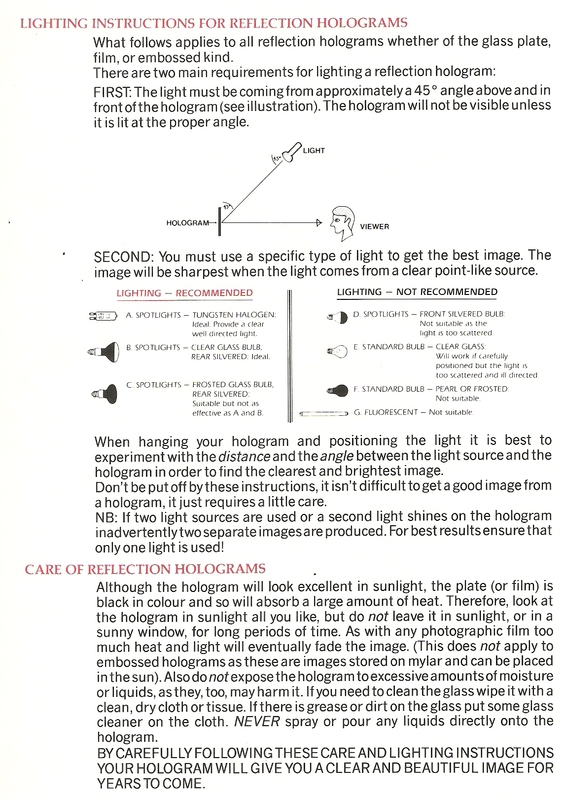 The hologram however, register the object from each point at the object (C, D)) without the help of a lens or a camera. It’s as if thousands of eyes on the hologram surface each can see the object. 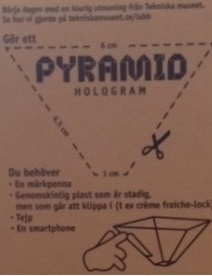 Innehållet i Hologram Kit – nu är det bara att sätta igång. 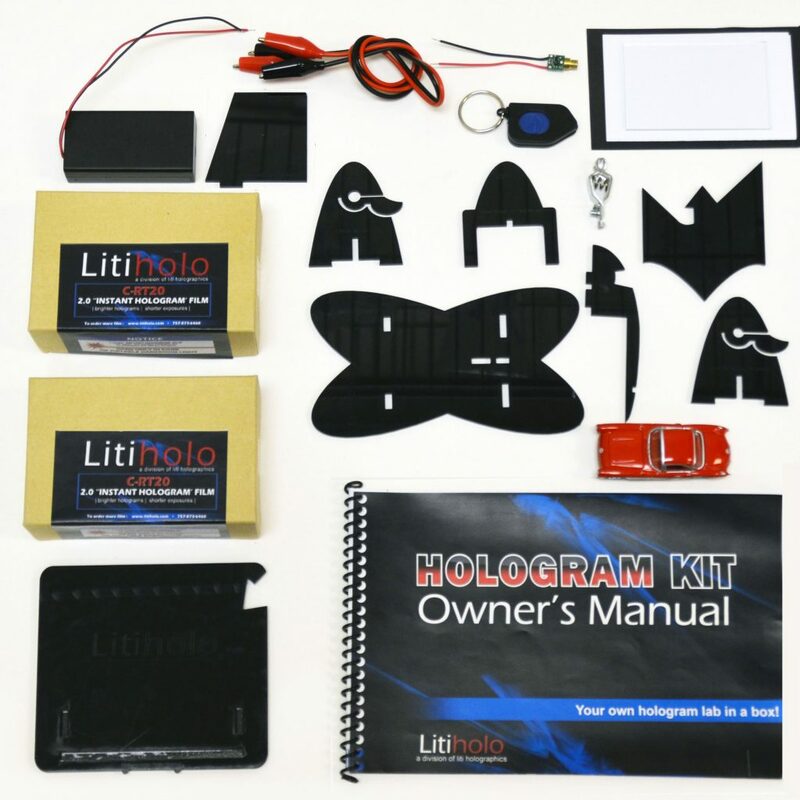 Speciellt intressant är Hologram Kit för skolor. Ange koden HM för att få rabatt. OBS! 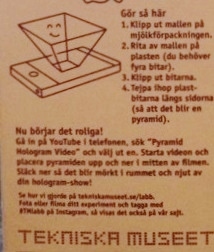 Var kritisk med vilken video du studerar för att skapa egna hologram. Alla hologram görs med hjälp av laserljus. Det finns många videor som beskriver 3D och hologram utan att vara det. Effekterna är då istället en projicering med hjälp av spegel, video och så vidare. 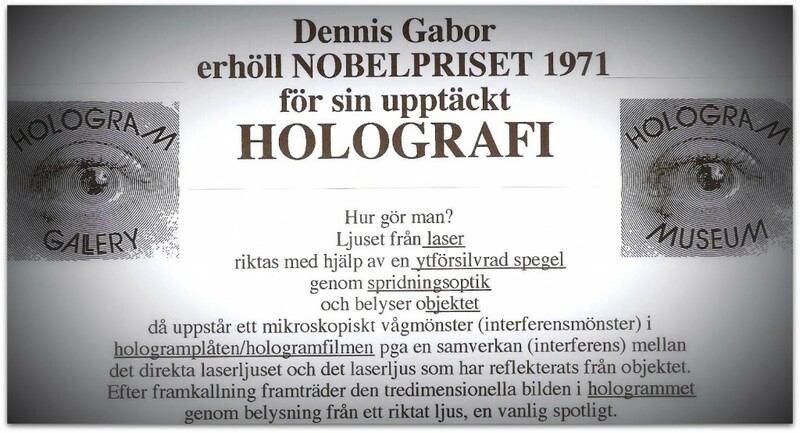 Men det är inte hologram som görs med laserljus och speciell fotografisk film med mycket hög upplösning. 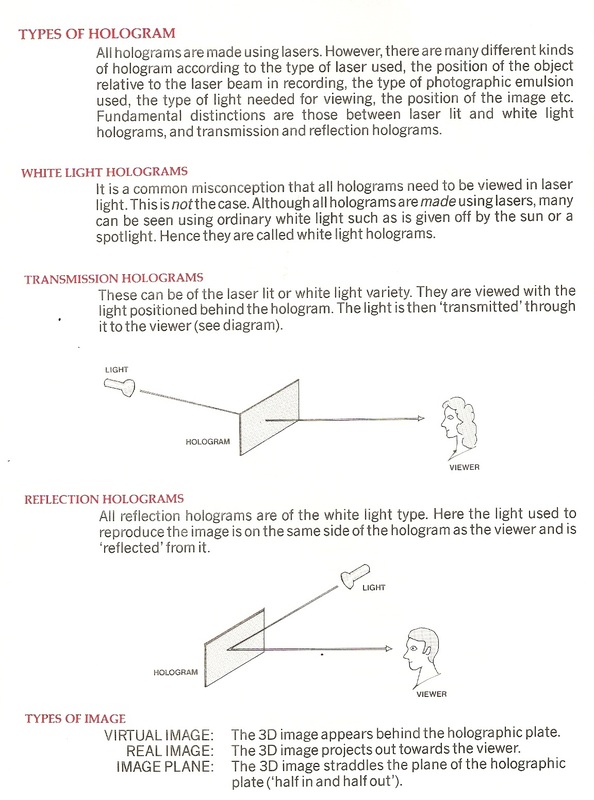 How are REAL holograms made? Holograms How holograms are made. Watch this video from Holographic Studio New York and listen to Dr. Laser, holographer Jason Sapan. 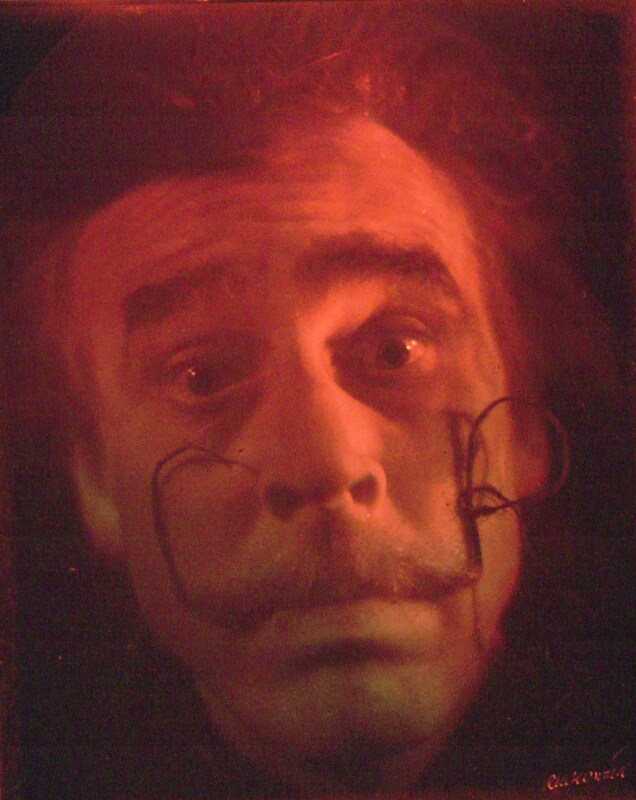 You will see how far away this Nobelprized lasertechnique, holography is from the computer animated projected film, called Peppers Ghost. ABBA, Tupac, Michael Jackson and many other famous artist will perform as Peppers Ghost, a 2Dimensional video projection. 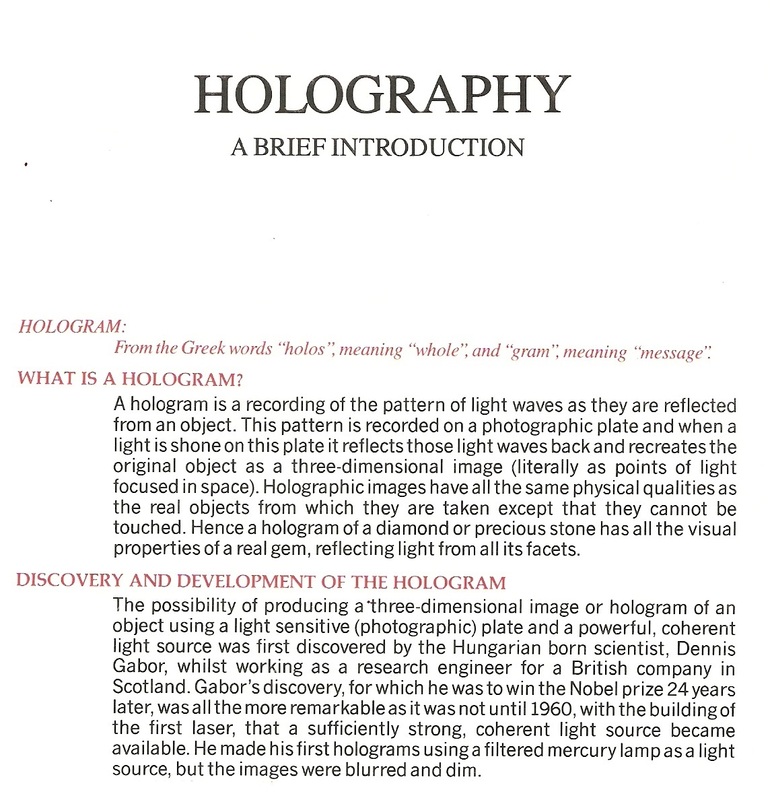 A REAL hologram is a 3Dimensional picture. They should be aware of that a hologram is produced with LASER. 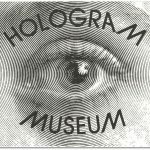 The Technical Museum successfully sold hologram products in the museum shop for many years. As the agent for the hologram producing companies of hologram gifts, we haven´t forgot The Technical Museum as a very serious customer! 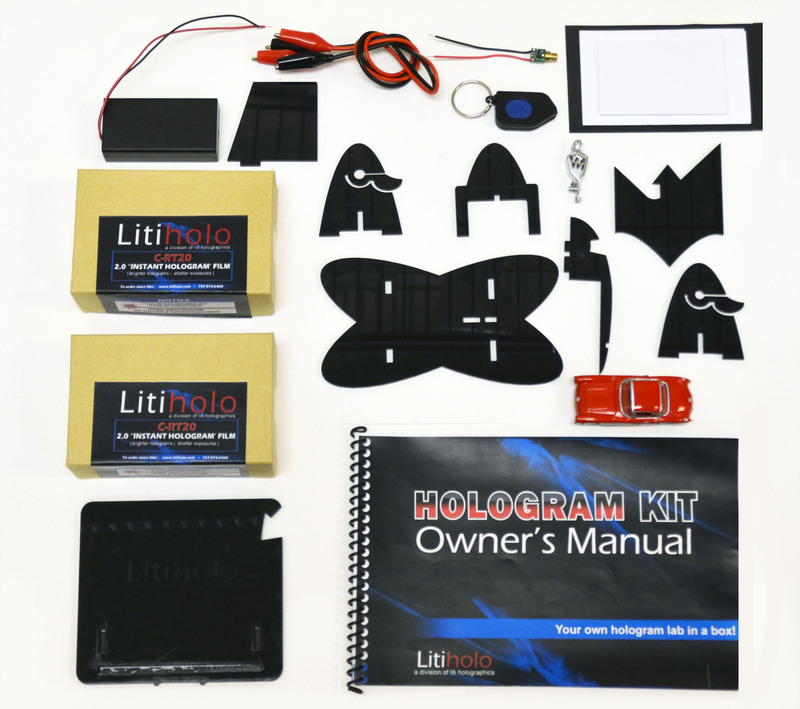 Here you can learn how a hologram is made! 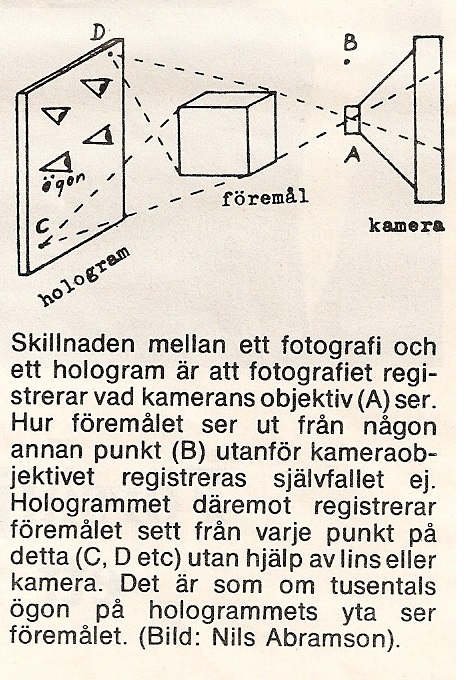 Här kan du se skillnaden mellan ett Hologram och ett fotografi.